UNCG students and community volunteers prepare and serve meals to homeless individuals at Greensboro Urban Ministry. 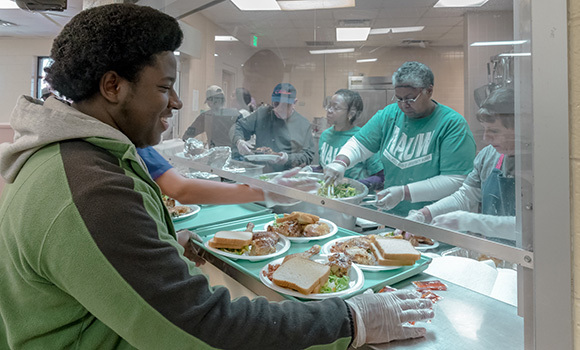 The impact of this year’s MLK Day of Service will be felt for years to come. Spartans spent Monday morning living out the legacy of Dr. Martin Luther King Jr. by serving others and investing in their community – repairing fencing at the historic Guilford Courthouse National Military Park, making fleece blankets for Project Linus and serving meals at Greensboro Urban Ministry, among other projects. The event, organized by UNCG’s Office of Leadership and Service-Learning (OLSL), is the university’s largest service event each year. Gage and her team work to identify service projects that fit the unique interests and skills of individual students and student groups. For example, UNCG’s Health Occupations Students of America chapter worked with Cone Health’s Alight Program, which supports local breast cancer patients and their families. UNCG’s commitment to service dates back to the beginning of the university – the motto “Service” was adopted by the school’s first graduates in 1893. Now, 125 years later, the motto still resonates deeply with students. To learn more about service opportunities at UNCG, visit olsl.uncg.edu. Check out the MLK Day of Service social media highlights below.